जय कन्हैया लाल की "
Another memory is of amma making the "Krishnar kaal" kolam - rice flour foot prints representing baby Krishna walking in from the entrance right upto the place of worship. This is a tradition I follow. When my little one was still in his baby/toddler days, I would use his feet to make the prints, later I used my hands ofcourse! The years spent in Mumbai hold memories of "Dahi handi" - it always amazes me to see the human pyramids formed by all these Govindas while they are splashed by water, not just by the monsoon Gods, but also by the human spectators. It sure is a thrill to see them reach out into the skies, so high, oh so high, to break the matki and collect their prize! And then there is all the stuff we get to eat! Thats one good thing about us Hindus - I mean we have got tons of festivals to celebrate and each comes with its own set of munchies to be prepared. Our deities sure were foodies. Take Lord Krishna - he loved milk products. His affinity for butter earned him the name of "Maakhan Chor" literally translated to "Butter Thief"! My mom used to make a lot of yummy goodies for neivedyam. Typically butter, poha, milk, sugar, fruits, appam, uppu and vella cheedai, paayasam, ribbon etc are offered. This year, I skipped the ribbon and paayasam. So, here I am with the recipe of one of the things made on this festival - atleast by us Tam Brams - Uppu Cheedai. Well, I usually write recipes of sweets associated with a festival, this time, for a change, I thought, why not pick a savory item. 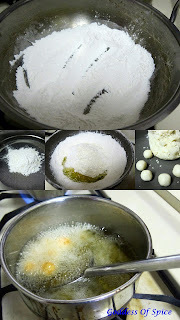 Dry roast the rice flour for a minute or so, don't let it change color. Dry roast the urad dal powder till it turns a reddish tinge. Sieve the flours and knead it into a dough after adding everything except the oil for deep frying. Roll the dough into tiny balls, set them aside for 10 minutes, then fry them to a golden brown. Drain them out on absorbent paper and eat - no wait, it was for neivedaym right? Offer it to Lord Krishna and then enjoy! Store the cheedais in an air tight container after they have cooled down. Set aside the rolled cheedais for a few minutes before frying. I do this so as to prevent the oil from bursting. Uppu cheedais are notorious for spluttering hot oil everywhere, so I always keep a distance while frying them!